Drug bins that allow users to dump illegal and prescription drugs have been installed at eight locations in the north west. The Remove All Prescription and Illegal Drugs (RAPID) initiative allows people to get rid of drugs anonymously. The north west bins are the first to be installed in the region since the scheme was launched in 2010. 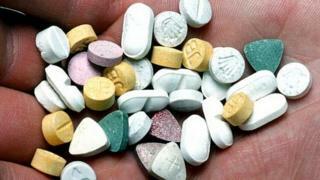 More than 100,000 tablets have been deposited in Belfast RAPID bins in the last eight years. Derry Mayor John Boyle said he hoped the public would "take advantage of the opportunity to dispose of any legally or illegally held drugs". "I hope the scheme will help protect the public from the dangers of misusing prescription, illegal and new psychoactive substances," he added. The multi-agency initiative involves Derry City and Strabane District Council, the PSNI, the Public Health Agency (PHA) and the north-west Drug and Alcohol Co-ordination Team. Denise McCallion of the PHA said the disposal bins are a "simple but powerful health intervention". "All of the partners are keen that the RAPID initiative is further developed and expanded over coming years with further bins installed, enabling more people and communities to learn more about the risks and dangers of drug misuse and to dispose of unwanted drugs easily and discreetly," she added. Of the 100,000 plus tablets deposited in Belfast RAPID bins since 2010, about 90% were prescription or over-the-counter medicines. There are now more than 30 RAPID bins at various locations across Northern Ireland.